Family Fitness is something that I promise is going to be a goal for this year with my family. As much as the kids and I love sitting on the couch, we must get up and move. Who am I kidding?! My kids love being active and moving around and so do I. The hard part is trying to find fitness activities that we all love. 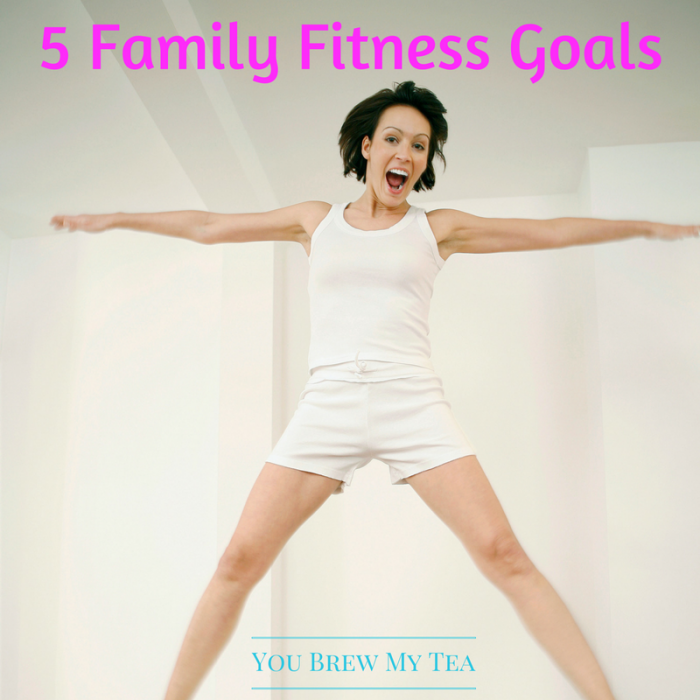 I have decided to make some family fitness goals for us for the New Year and here is what I came up with! As always, if fitness is new to you, then check in with your physician before beginning any family fitness program. This is important not just for adults but children as well. A regular wellness checkup before you begin any change in exercise is a great idea. These family fitness ideas are some of the easiest to do on a budget. For us, that is really important to keep in mind. With four children, it is really expensive to have a family gym membership or even to sign up for co-ed sports programs. Being able to do simple things together is much more manageable. I hope this list gives you some great ideas that are easy for your family to budget as well. Take more walks – My family recently moved and we didn’t get to walk as much this past summer as we are used to. For the New Year, I look forward to going on tons of walks with my family. If you don’t have a nice neighborhood to walk in, head to a local park, your local mall, or even check out the local school football field or track. There are always tons of places you can find local to you to walk together as a family. For families with older children, an at home family fitness room complete with a treadmill or elliptical is a great option as well for taking walks at home year round. Get involved in family activities – Things like sledding, skating, and skiing are all on our list to be more active as a family. Now that the kids are getting older, it’s super important for us to be able to do physical fitness activities together. I love the idea of using family fitness as another way to fit in some great memory building activities for our family. Winter months in our area bring about a good deal of snow. So, grabbing the snow sleds and going sledding is an obvious choice. Don’t miss out on other great winter sports ideas like skiing and more that you can check out on Winter Ninja if you need ideas. .
Skating whether it is with roller skates in our driveway in summer or at a local roller rink is always a fun way to burn off energy. Skiing can be something that you do in winter on ski slopes or in the summer behind a boat. Whatever you choose, these are usually fairly inexpensive but definitely fun family fitness activities. Run a 5K together – Again, my kids are getting older, so stuff like this is becoming easier. Training together with my older boys will be a ton of fun. I know the whole family will get involved as they can. There are some fees involved to register with some, but you can often find low-cost 5K events that don’t require much to enter. There are also a lot of options for family registry or group registry that offer discounts. The really family fitness isn’t just about the 5K itself, but about the daily training you’ll do to prepare for the end race. Try something the kids love – Being physical as a family, isn’t just about what we want as parents, it’s about what the kids want. The kids may want to get involved in Tai Kwan Do, so that is something we would all try! There are so many great things you can do together just for your kids. We often get so focused on what we enjoy as family fitness that we forget that we aren’t asking our kids what they actually enjoy doing. Maybe that is martial arts. Maybe that is gymnastics. Perhaps it is soccer, basketball, or even softball. Ask your children what they have an interest in, then work on it together as a family. Have more dance parties– If there is something that I have noticed about my kids, they love to dance. Dancing is a great way to get that heart rate up and have fun at the same time. Getting silly together with great music is one of the best family fitness options you can really focus on this year. Honestly, it’s my favorite. I can turn on the music and just let loose. There aren’t any special dance moves you have to know. You don’t have to be good at it. You don’t even have to keep time with the music. You simply have to move. I love using my Amazon Prime membership to play the latest hot dance music on Amazon Music to get the kids moving. This is especially handy since I can even censor for kid-friendly or pick my favorite Christian musicians that have upbeat songs and play just them. Family fitness is definitely a much easier way to manage your health this year. By focusing on doing things together, you can build healthy habits that are long lasting not just for you as parents, but hopefully for your children. Having struggled with weight loss and my health as an adult, I want my children to learn now early in life how to beat the odds and make easy healthy choices. I want to start with these family fitness goals now.